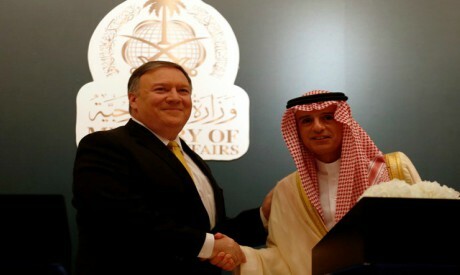 New US Secretary of State Mike Pompeo underscored the need for unity in the Gulf during a brief visit to the Saudi capital on Sunday as Washington aims to muster support among allies for new sanctions against Iran. One US official said Washington feared the rift risked undermining efforts to contain Iranian influence and crush Islamist militants. The trip comes as Trump considers whether or not to abandon by a self-imposed May 12 deadline the Iran nuclear deal he sees as deeply flawed. He has called on Gulf allies to contribute funding and troops to stabilise areas in Iraq and Syria where a US-led coalition has largely defeated Islamic State jihadists. On Wednesday, Iranian President Hassan Rouhani poured scorn on US and European discussions over changes to the nuclear accord and dismissed Trump as a "tradesman" who lacked the qualifications to deal with a complex international pact. Trump sees three defects in the deal: a failure to address Iranian ballistic missiles; the terms under which UN inspectors can visit allegedly suspect Iranian nuclear sites; and "sunset" clauses under which key limits on the Iranian nuclear programme start to expire after 10 years.